Nico Rosberg has topped the time-sheets at the first of a two day Formula One mid-season test at the Circuit de Catalunya in Spain. 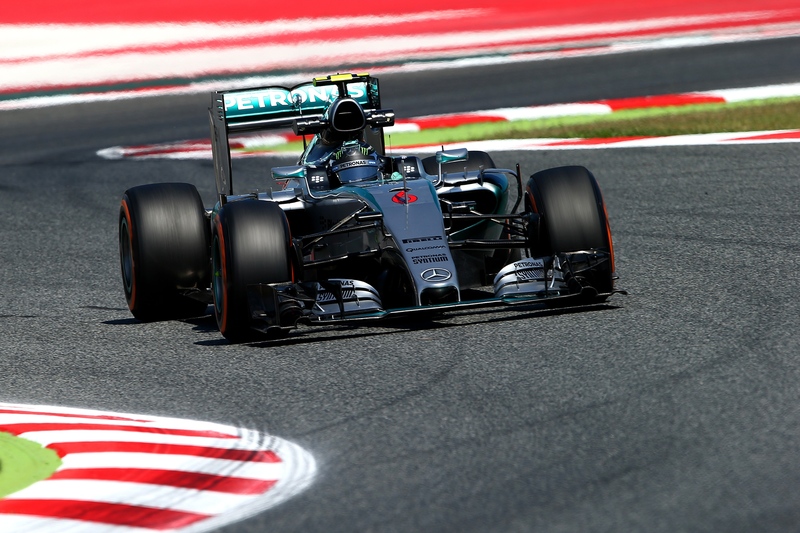 The German won the Spanish Grand Prix at the same venue last Sunday ahead of team-mate Lewis Hamilton. Today’s test is one of four days of mid-season testing, with one more day scheduled at the Circuit de Catalunya tomorrow before a further 2 day test following the Austrian Grand Prix at the Red Bull Ring in June. Every team apart from Manor elected to hit the track over the first 2 day test, with the team deciding to focus their attentions on getting their cars ready for the next round in Monaco instead. Nico Rosberg ended the first day in the same style that he did in the Grand Prix 2 days ago. The German was at the top of the time-sheets with a 1’24.374, a time that was 3 tenths quicker than his pole position time last weekend of 1’24.681. Nico also completed the highest tally of laps by a driver, with 146 laps adding to a total of over 700 laps at the circuit this year for the #6 driver if you combine his pre-season testing and Grand Prix weekend totals. Somewhat reminiscent of pre-season testing was how far up the time-sheets Sauber were. Marcus Ericsson put the C34 in 2nd place at the end of the day, falling just shy of 100 laps after a delayed start in the morning. Sauber’s third driver Raffaele Marciello was also in action today for Ferrari. The Scuderia junior driver logged 125 laps with a best time that was just 2 hundredths slower than Ericsson. The Italian will commandeer the Sauber for tomorrow’s running; with Marciello one of the only drivers to be taking part in both days of testing. Daniil Kvyat was 4th fastest as the Red Bull team continued to try and iron out issues with the Renault power-unit. Rumours emerged today that the Austrian outfit are in talks with Audi regarding a possible take-over, but this wasn’t on the mind of Kvyat, who completed 101 laps of the circuit. Fellow regular Formula One driver Pastor Maldonado was also out on-track today for Lotus, with the Venezuelan setting the 5th fastest time. He will hand the car over to reserve driver Jolyon Palmer for tomorrow. 2 drivers made their Formula One testing debut in today’s session, with British driver Nick Yelloly finishing the fastest of the two in 6th place for Force India. The 24 year old is currently driving with Force India backed GP2 team Hilmer Motorsport in GP2. He was scheduled to drive tomorrow, but his debut has been bought forward after Pascal Wehrlein decided to sit-out after feeling unwell. The second Formula one debutant was French Red Bull junior driver Pierre Gasly. Pierre finished as a runner-up in last year’s Formula Renault 3.5 season, with current Toro Rosso driver Carlos Sainz pipping him to the title. Gasly was driving Sainz’s Toro Rosso today, with the Frenchman taking the 7th fastest time; 3 tenths slower than Yelloly in 6th. Felipe Massa was the penultimate driver on the time-sheets after 54 laps. Massa struggled in the Williams in last weekend’s Grand Prix and the team will be scratching their heads as they try to find out what went wrong. They finished 1.6 seconds ahead of the final driver on the list; Oliver Turvey. Oliver was behind the wheel of the McLaren-Honda; with the team testing a number of different parts to try and improve their pace. Turvey will give the car back to regular driver Jenson Button, who spent half of Sunday’s race trying to cope with a very loose rear end. Button later labelled the race as the scariest of his life.